Only a few days ago the New York Times acknowledged that the CIA finding that the Kremlin hacked the Democratic National Convention’s computers with the intention of influencing the US presidential election was based, not on evidence, but conjecture. Today, the newspaper’s reporters have forgotten their earlier caveats and have begun to treat the intelligence agency’s guess-work as an established truth. Emblematic of the newspaper’s approach of acknowledging the uncertainty of many intelligence assessments only to quickly throw caution to the wind to embrace them as certain facts, was a December 15 report by Adam Goldman and Matt Apuzzo in which the two reporters wrote that the “hack influenced the course, if not the outcome, of a presidential campaign.”  The sentence is astonishing for not only stripping the CIA finding of its immanent uncertainty, but in venturing well beyond the intelligence agency’s judgement to aver what no one could possibly know, namely, whether the release of DNC e-mails influenced the presidential campaign. That it did, and at Clinton’s expense, is, of course, the conclusion the Democrats, if not a faction of the US ruling class associated with the Clintons, would like the US public to arrive at. In this, the New York Times has provided signal assistance as the unofficial propaganda arm of the US ruling class’s Democratic Party wing. Yet, we don’t even know if the DNC e-mails were hacked let alone by agents of the Russian government. One alternative explanation is that the e-mails were leaked by someone inside the DNC. Nevertheless, Goldman and Apuzzo claim to know far more than anyone could possibly know: that the CIA’s analysis is true despite the agency’s own admission of uncertainty and that, additionally, the Russian government intended to influence the outcome of the campaign and that its efforts bore fruit. New York Times reporters Julie Hirschfeld Davis and David E. Sanger were slightly more circumspect than the omniscient Goldman and Apuzzo, but nevertheless wrote of “Russia’s efforts to influence the presidential election,” as if this is not a matter of conjecture but established fact. They also mentioned Trump’s refusal “to accept Moscow’s culpability,” as if Moscow’s culpability is indisputable. Sanger is a member of the Wall Street-directed foreign policy think tank, the Council on Foreign Relations, of which most members of the Obama cabinet are also members, as were occupants of the most significant offices of the US state, going back to at least the Carter administration. The CFR is likely the body through which the anti-Trump faction of the US ruling class organizes itself. Let’s recall how much uncertainty underlies the CIA finding which the New York Times now accepts as fact, in the same way the newspaper quickly accepted as fact an equally tentative, and evidence-free US intelligence finding that the Syrian government had used chemical weapons in its war against Al Qaeda and the Islamist group’s allies, offshoots and auxiliaries. Today, “Assad’s use of chemical weapons” is bandied about in the Western media as if it were an incontrovertible fact, belying the reality that the US intelligence finding on the matter was based on belief, not evidence, and that there was, by Washington’s own admission, no “smoking gun.” What’s more, the idea that the Syrian military would use chemical weapons, which are less effective than conventional arms, when doing so would have crossed a redline drawn by Washington, and invited a more muscular US intervention in Syria, never made sense. How was this belief arrived at? Through a process the New York Times describes as attribution, “the skill of identifying a cyberattacker.” This is a fancy way of describing conjecture. Attribution is “more art than science,” the newspaper concedes, while acknowledging that it “is often impossible to name an attacker with absolute certainty.”  Finding water with a divining rod, and predicting the future with a Ouija board, are also more art than science, and both involve the process of attribution, the skill of identifying hidden water and hidden events, though it is often impossible to find water, and foretell the future, with absolute certainty. Divination and CIA analyses apparently have much in common. Other intelligence agencies, apart from the FBI, also doubted the CIA’s judgment call. This called into question an earlier, October 7, finding from the Department of Homeland Security and Office of the Director of National Intelligence. In a joint declaration, the US intelligence czars said they were “confident that the Russian Government directed the … compromises of e-mails from US persons and institutions, including from US political organizations.” But the intelligence community’s confidence didn’t rest on direct evidence. Nothing tied the suspected hackers to the Kremlin. The finding was, instead, based on a belief—“that only Russia’s senior-most officials could have authorized these activities” and that “the alleged hacked e-mails … are consistent with the methods and motivations of Russian-directed efforts.”  In other words, the intelligence community had no proof. The October 7 statement also referred to the hacked e-mails as “alleged,” suggesting that despite its claimed confidence, Washington wasn’t even sure the DNC servers were hacked. The e-mails could have been leaked from within. It is a reality of everyday life that decisions are made in the face of uncertainty. We can’t always defer action until evidence accumulates. For this reason, the US intelligence community’s efforts to arrive at a judgment based on fragmentary evidence and analysis is perfectly reasonable. But once decisions that are, in effect, working hypotheses become received doctrine—when “the DNC servers may or may not have been hacked, and the Kremlin may or may not be the perpetrator” becomes — “Russian cyberpower invaded the U.S,” as the New York Times put it— the process degenerates into propaganda. None of this is to acknowledge the sheer hypocrisy of the US government accusing the Kremlin of interfering in the US election when no other country has as extensively meddled in the electoral outcomes of foreign countries as has the United States. 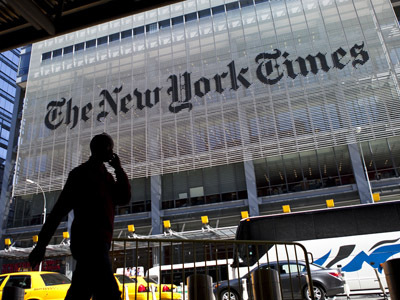 The New York Times offered a token admission of US culpability. “The United States, too, has carried out cyberattacks, and in decades past the C.I.A. tried to subvert foreign elections,” wrote Eric Lipton, David E. Sanger and Scott Shane. A few days later, Sanger expanded on US subversion of foreign elections. It “is worth remembering that trying to manipulate elections is a well-honed American art form,” Sanger noted. The C.I.A. got its start trying to influence the outcome of Italy’s elections in 1948, as the author Tim Weiner documented in his book “Legacy of Ashes,” in an effort to keep Communists from taking power. Five years later, the C.I.A. engineered a coup against Mohammad Mossadegh, Iran’s democratically elected leader, when the United States and Britain installed the Shah. “The military coup that overthrew Mosaddeq and his National Front cabinet was carried out under CIA direction as an act of U.S. foreign policy, conceived and approved at the highest levels of government,” the agency concluded in one of its own reports, declassified around the 60th anniversary of those events, which were engineered in large part by Kermit Roosevelt Jr., a grandson of President Theodore Roosevelt. And while in decades past it may have been that the “CIA tried to subvert foreign elections,” as the New York Times acknowledges, what isn’t mentioned is that in recent decades foreign election meddling has been transferred to the US government-funded National Endowment for Democracy. The organization’s first president acknowledged that the NED’s role is to carry out overtly the task of influencing foreign elections that the CIA had once done covertly. The NED has been active in attempts to influence electoral outcomes in Serbia, Zimbabwe, Belarus, Georgia, Ukraine, and elsewhere. The NED interferes in the elections of countries in which the sitting government has refused to fall in behind the United States as self-appointed leader of the international order, preferring self-determination and sovereignty. So Washington has manoeuvred to install biddable governments in these countries that are amenable to acquiescing to US leadership, which is to say, submitting to the international dictatorship of the United States. The incident should remind us that the US government often makes allegations on the basis of nothing more than conjecture, which “can always be affected by human biases,” as the New York Times concedes,  or political pressure, as the failure to find weapons of mass destruction in Iraq affirms. No less worthy of our attention is the reality that the mass news media have agendas which comport with the interests of their owners, that their owners belong to the economic elite, and that the economic and political elites are intertwined. This explains why the mass media act as conduits of propaganda through which evidence-free intelligence findings are regularly disseminated to the public to manufacture consent for, or at least acquiescence to, elite agendas; Iraq’s non-existent WMD are emblematic of a fiction attributed to an intelligence “failure” that was used as a casus belli to rally support for war. One can only guess—like the CIA guessing at who leaked the DNC e-mails and why—that there is a struggle within the US ruling class over the outcome of the US election, with the faction to which the Clintons belong resolved to prevent Trump from becoming president, or, at least, undermining his presidency. The reasons are likely due to intolerance of Trump’s promised departures from core US foreign policy tenets, especially his professed desire to treat Russia as a partner rather than adversary, his repudiation of the Trans-Pacific Partnership, and other heterodoxies.